Faast VS Kyber Swap VS Bittrex & Binance: Which Saves You the Most on Token Swaps? In a bear market, everyone is looking to save as much as they can on their crypto trades. Centralized exchanges are how most people get started with cryptocurrency, but as we’ve covered at length on this blog, these services represent a single point of failure, and make an enticing target for hackers. They also require you to give up your privacy by creating user accounts. While semi-decentralized exchanges and “DEXs” have emerged in recent years as alternatives, these often don’t have the specific trading pairs you might want. They also frequently charge higher fees. A few months ago, we published an article comparing centralized exchanges to instant exchanges, including Faast and Kyber Swap. We’d like to revisit this and see if Faast can still get your the best deal on token to token swaps. When we built Faast, we had two goals in mind: 1) to solve these problems by building an instant exchange that offered a wide variety of digital assets at competitive rates, and 2) simplify the whole process of building an exciting crypto portfolio. Did we succeed? 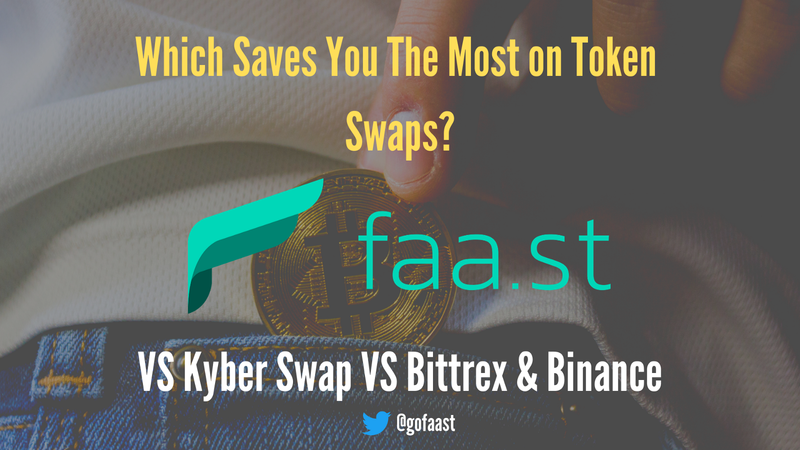 Let’s compare how much you save by using Faast to make some unusual token swaps versus using another instant exchange (Kyber Swap) or centralized exchanges (Bittrex and Binance). 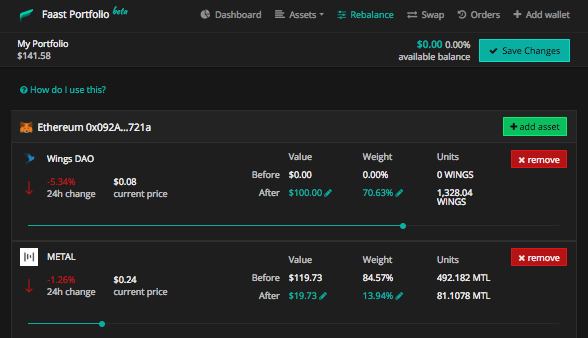 In our first example, we have have $100 USD worth of Aragon (ANT) in our MetaMask wallet. We want to exchange that for BlockMason Credit Protocol (BCPT). This swap as performed on 12/26/18, when $100 in ANT would come to about 215 ANT. 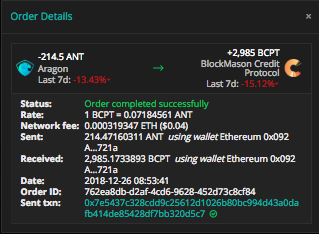 We connect our MetaMask wallet to Faast and use the “Rebalance” tool to free up $100 in ANT (214.47 ANT)and swap it for BCPT. The total cost? $1.88 USD. We’ll start by sending $100 of ANT to Bittrex from our Trezor wallet. In order to get the BCPT we want though, we have several obstacles in front of us. Bittrex, like most centralized exchanges, does not allow us to swap one token directly for another. Second, Bittrex also doesn’t support BCPT…in order to get what we want, we’ll have to find another exchange that does. Binance does support BCPT, but not ANT. So in this example, we’ll exchange our ANT for BTC on Bittrex, send it to our BTC wallet on Binance, and then exchange it for BCPT there. Of course, it’s risky to just leave it on the exchange, so we’ll withdraw our BCPT back to our Trezor wallet when we’re done with all this. Final withdrawal from Binance to hardware wallet. Send 222.20 ANT to Bittrex (gas cost $0.44) from our Trezor wallet. 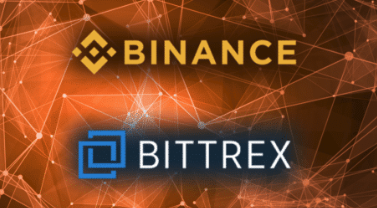 Send BTC from Bittrex to Binance (Tx Fee: 0.00050000 BTC, Total Withdrawal: 0.02436410 BTC). With Faast, our transaction only involved 1 step, and it was MUCH cheaper. The centralized route took much longer, was more complicated (5 steps), time-consuming and was more expensive. Not fun. Now, let’s compare Faast with Kyber Swap (which does allow direct token to token swaps) and see which one saves you more. As you can see, using either instant exchange is much cheaper than a centralized one, but Faast still comes out on top. Compared to both centralized exchanges and instant exchange competitors, Faast is cheaper, simpler, and EASIER. What are you waiting for? Visit https://faa.st/ and start making hassle-free token swaps right now. Further reading: MetaMask + Faast: The Easiest Way to Diversify Your Cryptocurrency Portfolio.